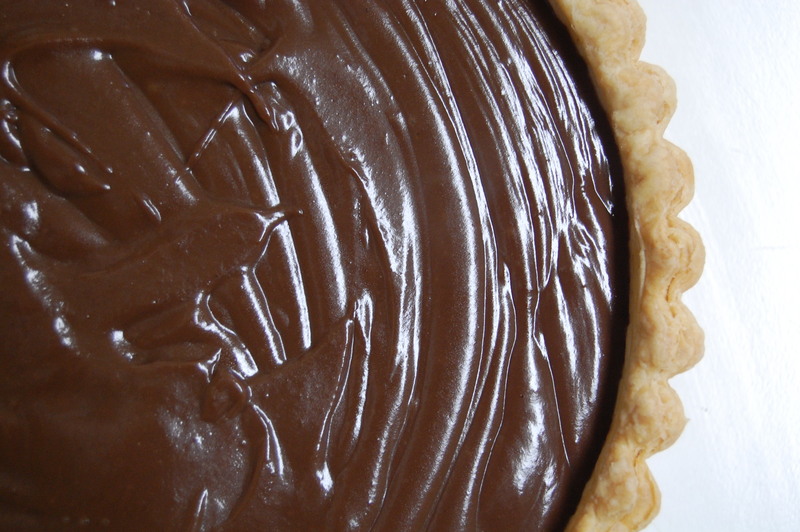 The Henderson Family Chocolate Meringue Pie | I made that! 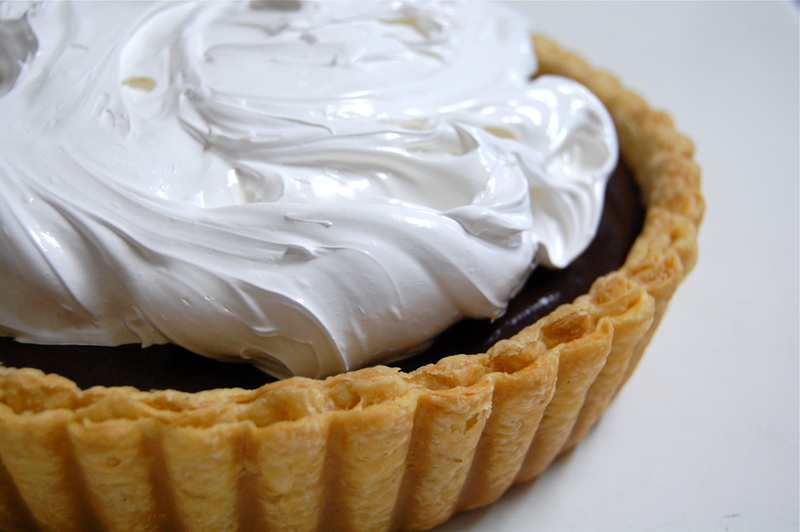 It’s not so big here on the west coast, but in the South every family has a chocolate meringue pie recipe. It’s a source of pride, even if it involves cool whip and instant jello pudding (yuck!). This pie has been in my family as long as I have (I suspect longer), and I am proud to say that it is about the only thing my father makes from scratch — well, except for the crust, but one day I’ll show him the light. It’s a fairly simple pie, but it does take a little while to set up, so it’s best to be made in the morning or the day before it’s to be eaten. First, since this pie will not be baked, a completely baked crust. Then I made a chocolate pudding, which mostly involves a lot of stirring. Since there are egg yolks in the pudding, I poured it through a sieve. And then filled my pie shell. Then I made a meringue (actually my friend Pantea made the meringue, because it was Thanksgiving and I was doing 13 other things). We used our fingers to pull strands of meringue into points, and then torched them until they were nice and golden. A word of warning: this is a messy pie. But it’s worth it. 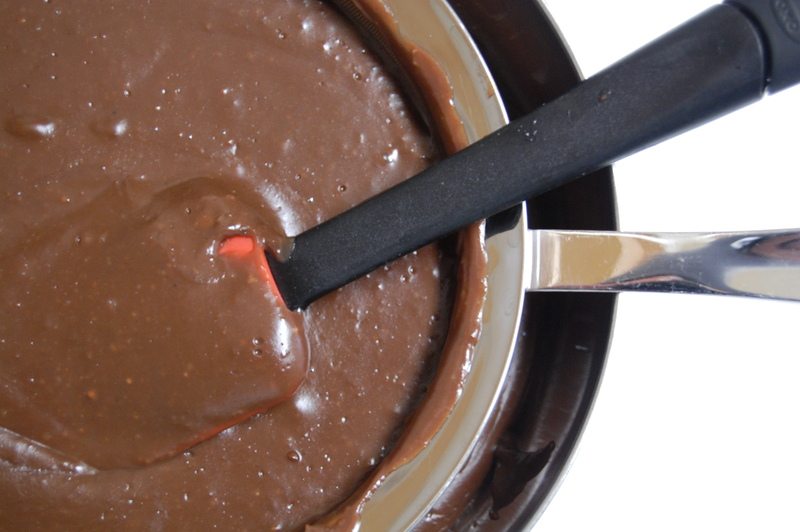 – Mix sugar, flour, cocoa and salt in medium bowl. Mix in egg yolks. Mix in milk 1/2 cup at a time, to prevent lumps. – Pour mixture into heavy bottomed saucepan and cook over medium heat, stirring constantly, until thickened. How long this takes seems to depend on whether the gods are smiling on you that day. But it should be really thick and starting to boil. – Remove from heat and stir in butter and vanilla extract. Pour through sieve into bowl. – Pour into cooled pie shell and chill in fridge for at least 4 hours to firm up. – Place sugar and egg whites in kitchen-aid bowl. Place bowl in pan of simmering water and heat, stirring constantly, until the whites reach a temperature of 140. Remove from heat and whip on medium high until the meringue has cooled and tripled in volume. Beat in vanilla extract. – Spread over cooled pudding and shape. 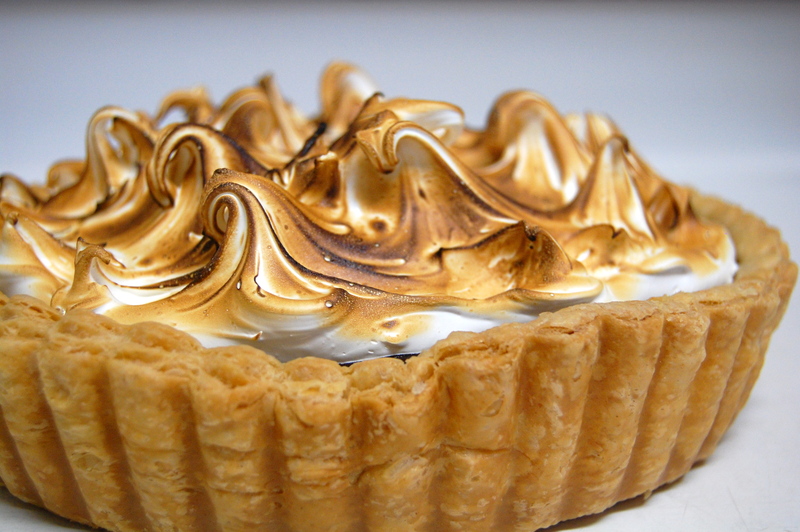 Use a propane torch to toast meringue edges. Keep in fridge until ready to eat. What a (picture) perfcet pie shell! found you thru orangette…good luck @ delancey…your photos are amazing & recipes look great…when you are settled in can you share your pie crust recipe. thanks. I had to restrain myself from licking my monitor. Can’t wait to make this, I think I just figured out what we’re having for our Christmas for Two dessert! Thank you so much! 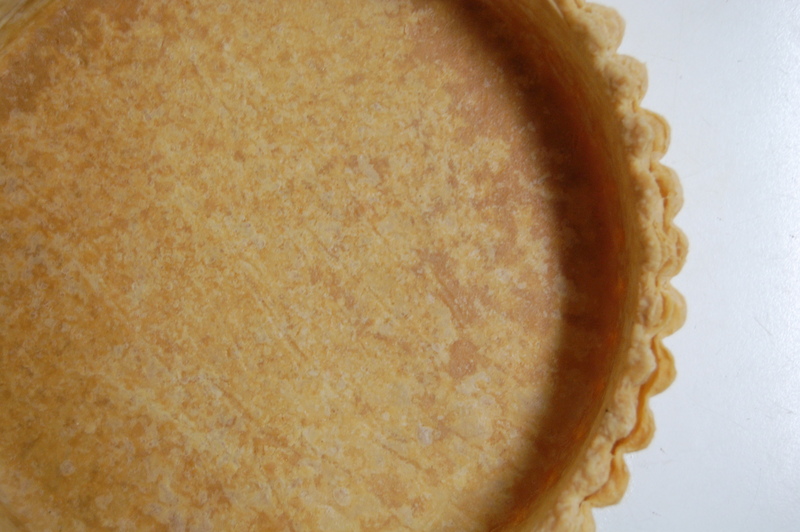 I plan on doing a post detailing how to make a flaky pie crust very soon. I just moved to Seattle yesterday, so first I need to emerge from this giant pile of boxes! The recipe is your basic one- a 3:2:1 ratio, 9oz flour: 6oz butter: 3oz water. The flakes are in the technique. More on that later! x2 on that pie crust. it’s gorgeous. recipe? pretty please? I ditto the flaky pie crust recipe request. AMAZING!! I have never seen such flakiness before and ALL your pies have the same crust. I searched your blog and came up with this recipe (https://lookimadethat.wordpress.com/2009/10/19/appledumplings/), but using this technique (https://lookimadethat.wordpress.com/2009/09/09/tomatogalette/) then someone posted a reply to that post and said something was missing. Then I read a 3-2-1 comment above. I am familiar with the ‘spreading the dough with the heel of your hand’ technique. So is it safe to assume you use the 3-2-1 (9 oz flour, 6 oz butter, 3 oz water) and use the spreading technique with the heel of your hand? I’m vietnamese and a pie lover. But i’m begginer in the kitchen. When the whites reach a temperature of 140, it is thickened, isn’t it? So how you can whip it on?